It’s a good start to the luxury single-family home market for 2019, which shows no signs of slowing after a strong 2018. Home Builders Research reported the 69 new single-family home closings in January and February at prices $750,000 and above. That bettered the 51 during the first two months of 2018. In the luxury resale market, there were 132 single-family closings so far this year compared to 123 in 2018, Home Builders Research reported. Those numbers build upon the luxury segment strength of 2018. In the new construction market in 2018, there were 599 closings of homes $750,000 and above, 70 percent more than 2017 when there were 352 such new home sales. In the resale market, there were 885 single-family home closings in 2018, 16 percent higher than the 762 in 2017 of $750,000 and above. Realtors have talked about many newcomers to Las Vegas and even long-time residents are turning to newer homes rather than renovate outdated Mediterranean-style homes. “That makes sense if you’re going to spend that kind of money to go for something brand new with newer technology,” Smith said. Smith said one reason for the increase is that construction costs have increased and prices of existing homes have gone up as well, pushing more homes to that $750,000-and-above level. For some, price increases aren’t that much of a deterrent, he said. “That segment of the market doesn’t get affected so much,” Smith said. The luxury town home and condo market was also strong in 2018. There were 42 such sales of $750,000 and above in the new construction market in 2018, up from 22 in 2017. That market has been bolstered by the sale of the Vu luxury town homes in MacDonald Highlands. In the resale condo and town home market, there were 134 closings in 2018, 18.5 percent higher than the 113 in 2017. So far, in the first two months of 2019, there were 10 new town home and condo sales compared to three in the first two months of 2018. The only category that showed a decrease in the luxury market was resales of condos and town homes of $750,000 and above for the first two months of 2019. There were only 11 so far this year compared to 41 during the first two months of 2018. Among the luxury single-family new home communities with an average base price of $750,000 and above are Blue Heron developments in Southern Highlands, MacDonald Highlands and Lake Las Vegas. Others include DR Horton — Estates at Tomiyasu; Lennar — Olympia Ridge; Pardee Homes — Axis; Pinnacle Homes — Desert Trace; Pinnacle Homes — Skyline Mesa; Pinnacle Homes — Skyline Summit; Pinnacle Homes — Villaggio; Toll Brothers — Granite Heights; Toll Brothers — Los Altos; Toll Brothers — Mesa Ridge; Toll Brothers — Mira Villa; William Lyon — Lago Vista; William Lyon — Silver Ridge; William Lyon — Tuscan Cliffs. There’s also the Richard Luke Collection at MacDonald Highlands. MacDonald Highlands master listing agent Kristen Routh-Silberman, a Realtor with Synergy|Sotheby’s International Realty, said the luxury market above $3 million is even taking off. 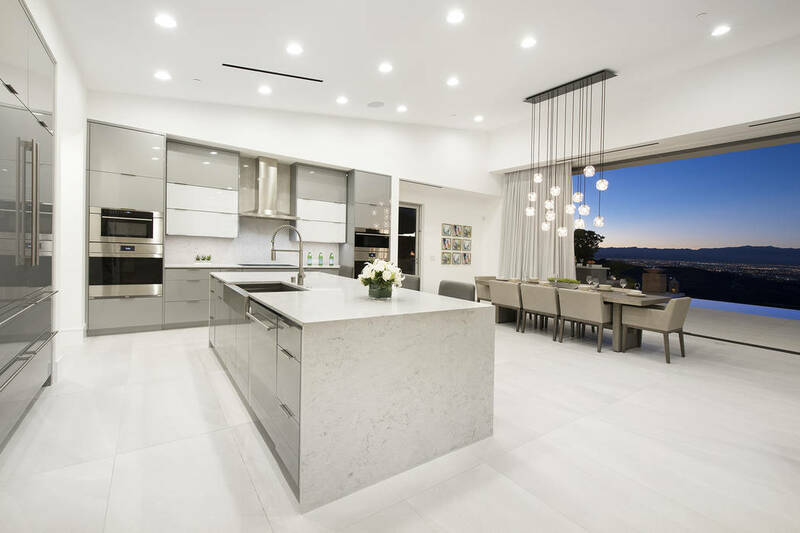 Routh-Silberman said it’s a seller’s market in the luxury segment because there’s not enough inventory and builders to construct them quickly enough. She said she doesn’t see it slowing down the rest of the year, and when people are done filing their taxes by April 15, it will pick up even more. Routh-Silberman said she’s seeing the strength in every category of luxury from resale to new homes to town homes, but the strongest demand is one-story homes measuring 5,000 square feet to 6,500 square feet. She said during the first three months of 2019, in terms of new and existing home sales, she’s done what she did in the first six months of 2018.